A new report released five years after Kabul's citizens celebrated the fall the fundamentalist Taliban regime paints a bleak picture of the rising insurgent violence that has claimed 3,700 lives across Afghanistan in 2006. Militants launch more than 600 attacks a month, a fourfold increase from the monthly average of 130 last year, according to the report by the Joint Coordination and Monitoring Board, a body with Afghan and international representatives, including from the United Nations. It was issued on the eve of Monday's anniversary of the Islamist militia's ouster. The rising drug trade in Afghanistan has "significantly helped fuel" the insurgency in four volatile southern provinces, and the slow pace of development is contributing to popular disaffection and impeding efforts to curb the opium production, the report said. The insurgency "threatens to reverse some of the gains made in the recent past, with development activities being especially hard hit in several areas, resulting in partial or total withdrawal of international agencies in a number of the worst-affected provinces," it said. Five years ago, on Nov. 13, 2001, Taliban fighters retreated from Kabul ahead of an advancing Northern Alliance force, heralding the fall of its fundamentalist regime, and prompting street celebrations by Afghans who openly played music and shaved off the long beards that had been mandated by the hard-line regime. A U.S.-led coalition began its invasion of Afghanistan in October 2001 to oust the Taliban regime for hosting Osama bin Laden. Afghanistan enjoyed a relative period of calm in the years after the invasion, but insurgents have this year launched a record number of roadside bombs and suicide attacks, and there have been heavy clashes all year between insurgents and Afghan and NATO security forces, particularly in the southern and eastern provinces near the border with Pakistan. The 3,700 deaths the new report attributes to insurgent-related violence is comparable to the number of deaths — about 3,500 — tallied by The Associated Press this year based on reports from the U.S. military, NATO and Afghan officials. In the latest violence, more than 20 Taliban militants — and possibly as many as 60 — were killed during clashes near the frontier in Paktika province, officials said Sunday. Gen. Murad Ali, the deputy Afghan army commander for Paktika, said 20 bodies were recovered from fighting in Barmal district the last several days. In addition, he said, two trucks carrying Taliban fighters were destroyed by air strikes or artillery fire, and officials estimated 40 fighters were killed in those strikes. Four NATO soldiers and three Afghan soldiers were injured, he said, though a NATO spokesman said he wasn't aware of any serious injuries among NATO troops. Barmal is home to a military base that hosts both Afghan and U.S. soldiers. Spokesman Maj. Luke Knittig said the operations in Barmal were part of an ongoing Afghan-NATO mission to root out Taliban militants before winter settles in. He said the estimate of 60 dead fighters sounded "about right" but didn't have an independent estimate of the number killed. "We are not into the numbers game here lately," he said. Death tolls in remote areas of Afghanistan are almost impossible to verify and often vary widely. Abdul Baqi Nuristani, the provincial police chief, said only 25 militants have been killed in Barmal over the last couple of days. 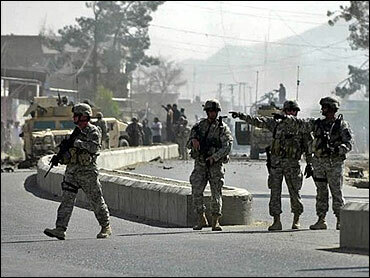 He said three Afghan and three NATO soldiers were injured in "a very big battle." Ali said tribal elders took the bodies of eight Pakistani fighters back over the border to be buried. Afghan officials have repeatedly accused Pakistan of not doing enough to prevent Pakistani or other foreign fighters from crossing the border to launch attacks. Pakistan says it does all it can, though border attacks have increased since a September agreement led the Pakistani military to pull out of its lawless tribal region.